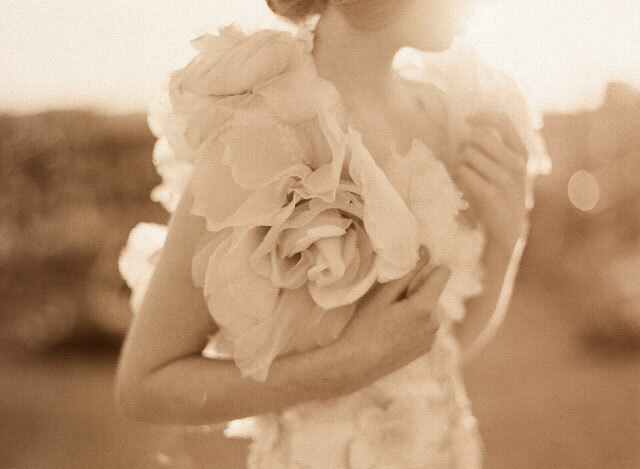 In our blog article, White w/ a Twist, we received a comment from Rebellious Bride Punky that she loves Claire Pettibone's bridal couture style--that they were sweet yet also modern. And I couldn't agree more. Part fairy, part goddess, part medieval, part edgy, her style is rebellious yet totally soft and dreamy. I love that ALL her bridal gowns, and I mean ALL of her creations are so unique and "non-wedding-y" so much so that I had to triple check if I was really looking through the bridal couture section of her website. Watch the bridal fashion show video below -- it's insane how all the gowns are rebellious in its own way. Let the show take you to places you've never deemed possible!